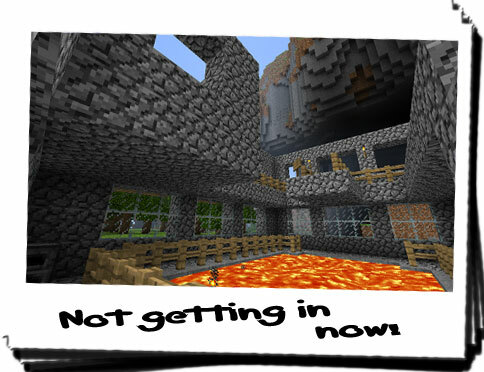 Diary of a Miner: Day 12: Today I made TNT! Tomorrow, cookies! I woke up really early again today to see if I could catch a glimpse of anything suspicious. I took both my sword and bow this time to ensure I knew where it was, and headed towards the water trap. It was still partially dark, but even then I could still see that nothing was there, except the pork chops. Although, having said that, the sheep seemed to have disappeared... Turning my attention to the cliff system, I didn't see anything moving that I couldn't easily explain as being a sheep or a cow. I think I was thinking about this shadow too much; I had a job to do, and so far I hadn't really accomplished anything! I had a small mineshaft, a house and the beginnings of a forge... in the MiNES I'd have probably found some of the more precious ores and redstone by now! Although this wasn't a MiNES, this was real life! Casting this from my mind, I turned my attention to the forge, or the start of it anyway. I'd already finished the top floor walkway and I really needed to finish putting the safety fence in. I quickly installed these, and then I notcied a big flaw with its position: the upper floor windows were the perfect height for creatures and animals to get into it! I fixed this with a long, but complex, method of digging out the hill! This made sure that there was no way anything could get from the hill to the forge without going through the front door! Whilst widening the gap between the forge and the hill, I found a small vein of coal, and it got me wondering: if I widen my mines all across the area I was familiar with, I'd maximise my chances of finding something! Especially if each mine was set to a different depth! 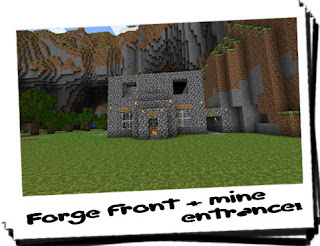 So that's what I did; I began another mineshaft going straight down from under the hill, but I linked its entrance to the front and inside of the forge. This gave me the option to choose an exit if a rapid escape was necessary! It was at this time I got distracted... again! I had to return back to the house to retrieve more cobblestone for the forge walls, when I noticed the pouch again, lying at the bottom of the chest. I took it out and decided that now would be a good enough time as any! Going back to the forge, completely forgetting the cobblestone I returned home for in the first place, I placed the pouch on top of the furnace I had there. 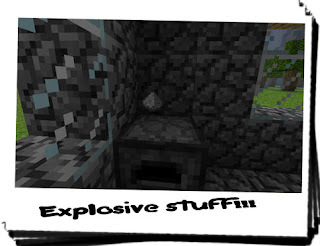 Opening it and taking a small pinch of the fine powder inside, I cast it into the lava pit, and was met with nothing. I was hoping there would be bright sparks, but nothing; it simply fell into the lava... I was sure this was the basis for TNT so I decided to go hunting for sand! As my farm was literally on the edge of the beach I didn't have to go far, and, checking on my farm as I went past, I returned with a bucket of sand. Placing this atop the furnace too, I poured a small amount of the sand into a small portion of the powder and I mixed them thoroughly. I then repeated the same action, and was rewarded with bright yellow sparks! Now I had the basis for TNT! I constructed a simple tube from a reed and poured a minute amount of the newly formed powder into it. I used a stone to wedge a piece of string into the top and voila! I had a stick of dynamite! The only problem was, this was useless for mining! 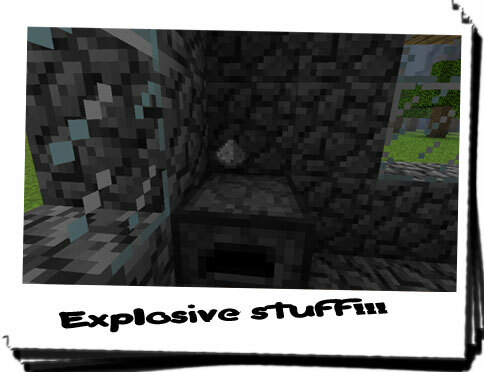 It packed barely enough punch to get through stone and it had an incredibly small blast radius! The only use this was for was possibly protection and maybe firewoks! What I needed was blocks of TNT. I easily had enough to make TNT blocks, and I could probably make it last further by adding a greater ratio of sand to the sulphur! But I needed two things: a container that was strong enough to carry the contents but would vaporise on detonation. The other is a redstone fuse to carry an electrical signal to detonate the TNT from afar. The fuse would be paramount for these quantities of TNT as it would be fatal to simply light a fuse! This meant that I would have to do some heavy duty, deep shaft mining. This meant rather than steps, I'd have to create ladders; I was going straight down! Obviously what with the building of the forge, I hadn't left myself any time to safely begin, so I decided to leave that for tomorrow! 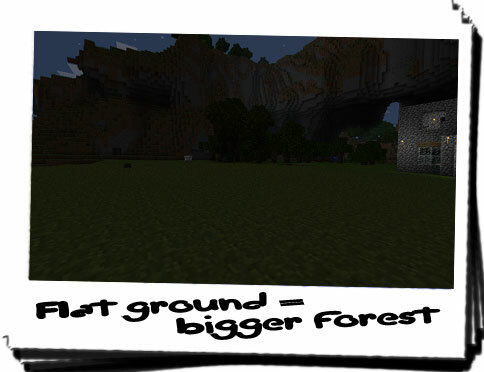 When I left the forge, I noticed that the majority of the ground was bumpy and uneven, with the occasional hill here and there. 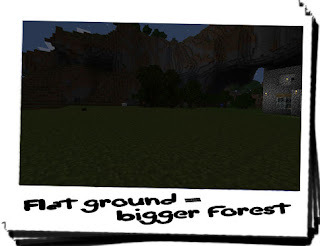 It occurred to me that a bigger, flatter expanse of land would mean more room for the growth of trees, and therefore a very large supply of wood; if I was going to expand my mining operation, I was going to need lots of wood to line the shafts to prevent collapse! I began leveling it out, ensuring that I didn't interfere too much with the wildlife, and left the top soil on top. I then planted a few more trees. By this time is was getting pretty dark, as the photo shows, so I returned home. Tomorrow I'll start on the new vertical shaft to try and find some redstone for the fuse. If I can, then it might make subterranean mining much easier, especially as it would widen my scope rather than sticking to a single shaft. For now however, back to the mysterious book; it seems the more I look at the runes, the more it seems I could solve it! It sounds crazy, but I could've sworn I've seen theses runes before!